We like everything about this place, the lodges are located in a campus site, it makes you feel safe (at least for us it was important since we had a rental car). You enter a big residential area with your card, also you use the same card to access to the Blue Bay Beach for free (for outsiders it costs 16 fl), which then includes sun lounges, umbrellas, toilet facilities. The lodges are places at the same site, the beach is around half km far from the lodges. You need to walk through a golf court to get there, it is a nice walk, just make sure you spray your mosquito sprays. Also it is nice to run in the campus, plus there is a gym. Not sure whether they charge extra money though. You have everything you need in the apartment (including the beach towels), just bring your own washing powder if you wanna wash your clothes on the laundry (laundry is for free, this is also another nice point). The location is wonderful. The lodge is very comfortable and well equipped. If you are looking for a non all inclusive getaway the Blue Bay Lodges are ideal. Located on a beautiful golf course, walking distance to the beach and restaurants. Blue Bay is a gated large, lovely area and has private homes, several B and B’s, three restaurants, a beach bar, a private beach and an 18 hole golf course. BB Lodges is just one choice among many. Free daily beach access came with our “lodge.” The WiFi is terrific, there are plenty of channels available on the flat screen and maid service three days per week. Grocery store is about 10 minutes away. Beach is a 10 min. Walk and restaurants are near the beach. Willemstad is a 15 to 20 minute drive. You need a car if you are staying more than five or so days because it’s very quiet and gets boring. There is a washing machine but no dryer. The people that work here are really nice. It is very safe. The staff were wonderful in giving us a late check out to accommodate our late flight. 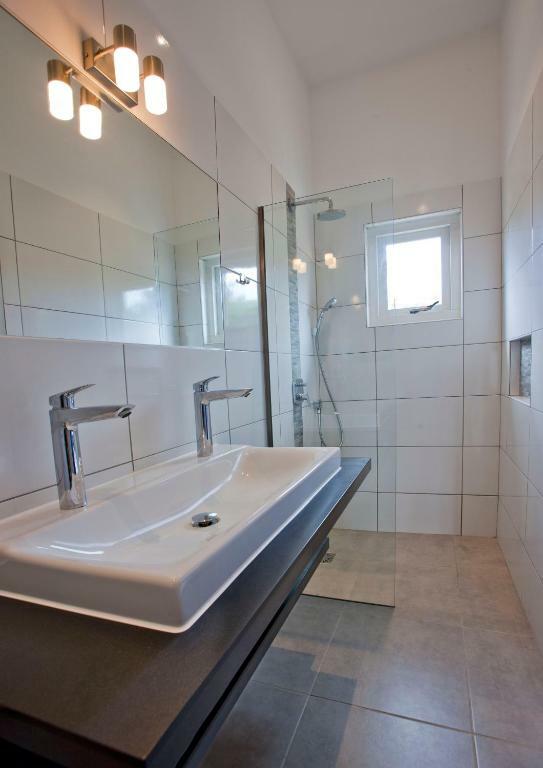 The unit is spacious, clean, and up to date. We loved our private balcony! Very nice accomodotion on a very big resort. Beautiful beach, friendly staff. Lock in a great price for Blue Bay Lodges - Sunny Curacao – rated 8.5 by recent guests! Blue Bay Lodges - Sunny Curacao This rating is a reflection of how the property compares to the industry standard when it comes to price, facilities and services available. It's based on a self-evaluation by the property. Use this rating to help choose your stay! Located within Blue Bay Resort, Blue Bay Lodges - Sunny Curacao features on-site dining and water sports. 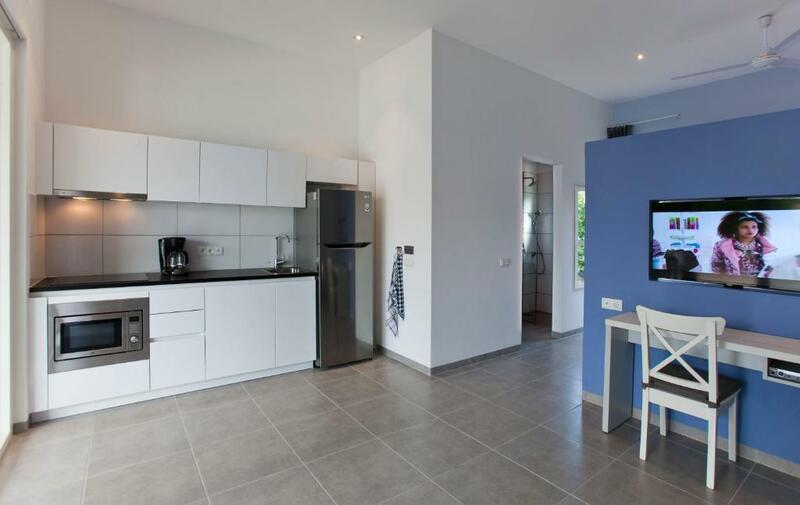 Spacious studios provide kitchen facilities and private terraces, just a 10-minute walk from Blue Bay Beach. Guests can swim in the outdoor pool or play tennis on the 2 courts which are lit at night. The accommodations is built around an 18-hole golf course. Diving lessons and equipment rental is available on-site. 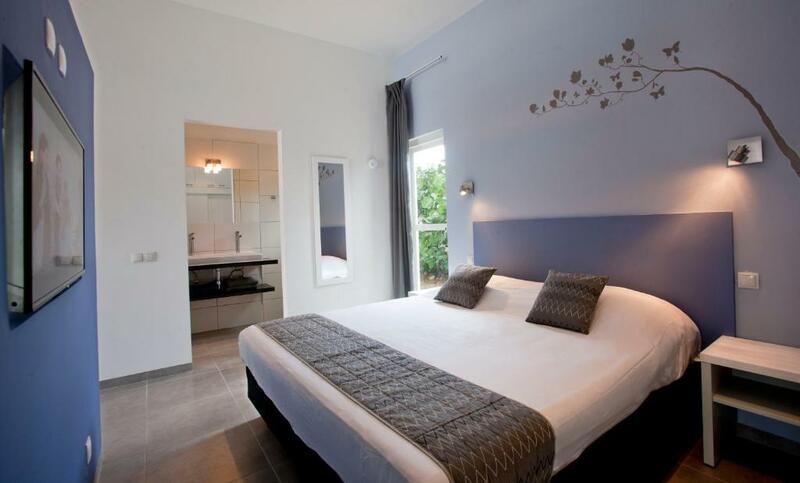 The open studios at Blue Bay Lodges - Sunny Curacao are decorated with an accent wall and white bedding. Each has free Wi-Fi and cable TV. A small dining area is available inside or guests can dine on the terrace. Hato Caves are less than 15 minutes’ drive away. Curacao Sea Aquarium is 10 minutes’ drive from the accommodations. Restaurant AzZuro, located on the beach, is open for breakfast, lunch and dinner. Drinks are available at the sunset bar. Live music is available on select nights at AzZuro Bar. 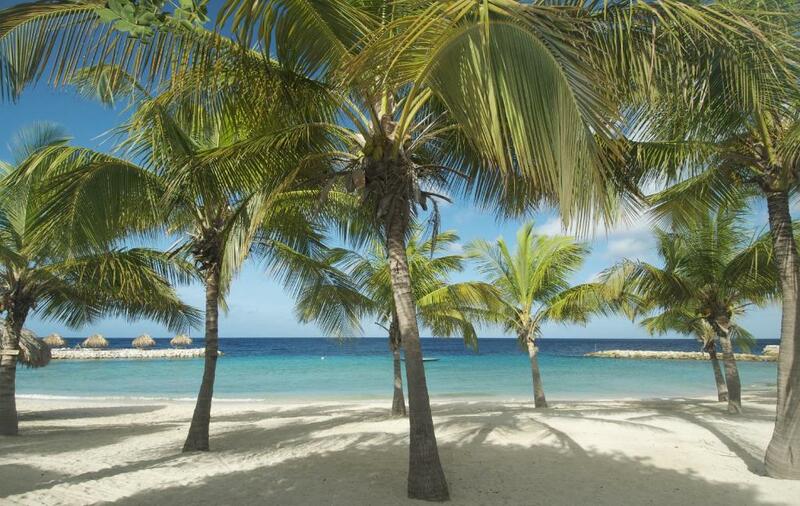 When would you like to stay at Blue Bay Lodges - Sunny Curacao? This spacious studio features a full kitchen with hob and cooker, a private terrace and air conditioning. This studio has a electric kettle, dining area and kitchenware. Uw startpunt voor een heerlijke vakantie op Curacao.Sunny Curacao biedt u zeer comfortabele lodges en lodges superior aan op het Blue Bay Curacao Golf & Beach Resort, een prachtig resort gelegen nabij Willemstad en direct aan de helderblauwe Caribische Oceaan. Geniet van de zon en zee, de prachtige natuur en nog veel meer. We, Ed en Marijke Lakerveld, are the owners of Blue Bay Lodges. As we live already 10 years on Blue bay Resort and are happy to help you with all your questions, and requests to make your holiday on Curacao special. There is a 18-holes golfcourse and a very nice and sandy beach with palmtrees. Furthermore a dive- and beachshop on site with a beautiful house reef for diving or snorkling. On the beach you can choose for the Azurro restaurant for breakfast , lunch and dinner, and in the evenings as well the Sunset and Grill restaurant, and Pictures, a mediterranean restaurants with pizzas and pastas. Blue Bay Golf & Beach resort has 24 hrs. security. House Rules Blue Bay Lodges - Sunny Curacao takes special requests – add in the next step! All children under 6 years are charged USD 12.50 per night for extra beds. Any additional older children or adults are charged USD 12.50 per night for extra beds. ATM card Blue Bay Lodges - Sunny Curacao accepts these cards and reserves the right to temporarily hold an amount prior to arrival. Blue Bay Lodges - Sunny Curacao accepts these cards and reserves the right to temporarily hold an amount prior to arrival. Please note that after making the reservation, your credit card may be pre-authorized for the amount of the first night. Please inform Blue Bay Lodges - Sunny Curacao of your expected arrival time in advance. You can use the Special Requests box when booking, or contact the property directly using the contact details in your confirmation. The cleanliness of the environs and the beach was lovely. The kitchen was equipped with wares and stuff. Not enough hooks, shelving for clothing, hanging beach towels. Curtains were dirty. The bed linens looked tired. The 2 beds pushed together were not pleasant. Great balcony for breakfast or late night drinks! Appreciated the cleaning services on Monday, Wednesday and Friday. Rooms were only cleaned twice a week, unacceptable for the price. It would be nice if the dish washing gel and sponge is provided, you provided shampoos as basics, but in an apartment the dish washing gel and sponge is also part of basics. It would be nice to have fly blockers in the bathroom window, since the bathroom does not have air circulation system, we felt the need of leaving the window open, which caused flies to enter inside. I got bitten by the mosquitos so badly. (also i have allergies to bites, my body was swollen very bad, luckily i had my anti-histamins with me) Also there should be a solution for the sound of the fridge, it makes a lot of sound, which caused us to have a bad sleep. We received 2 single beds which were connected to each other, we would actually prefer 1 big double bed instead. It would be nice to have the room service everyday, currently it is offered only once every 2 days. Also the clothes hanger was hidden in a small storage room with a lot of dust and it had a lot of stain on it. it definitely needs to be replaced, because it caused our clothes to be coloured with the stain colour. Too isolated, no shuttle service, difficult to get a feel for the island without a car. Cannot get water hot enough for a relaxing shower. Pillows, duvets need to be renewed - so stained. Restaurants way too expensive for what you get. Nice beach, very quiet, safe, good for relaxation. Golf and water sports on site. Well appointed lodges with AC. The resort has several small hotel accommodations that are not part of the Blue Bay Golf & Beach resort. So the amenities apply differently. The lodges are 1 mile away from the beach & restaurants. You need a car or rent a golf cart to get around the resort. There is no shuttle on the premises to get visitors around the resort. But if you're staying in Blue Bay garden or villas security will pick you up. There is no transportation for lodge visitors. The website description is inaccurate; first, check-in 3-5pm not true if you arrive after 3pm your key will be left in a key box & require a code, there is no receptionist available to help schedule excursions or taxi so you will have to go to the main receptionist of the golf resort & they'll try to help you. When booking the room online the bed selection does not provide accurate details to the set up of the room. The room isn't all that clean, luckily I had Clorox wipes & Lysol. This resort caters to time share owners and residents b/c all the apartments & villas are closer to the beach. You need a car to get into town b/c it is at least 20 mins away driving & not that easy to get there. You have to be familiar with the island. I will not return to this resort. The staff at the beach bar was not very nice and the service was very slow. The signage to walk to the beach from the lodge was poor. The stones in the seawater near the beach. What I did not like is the fact that we were not informed that a room with the requested type of bed was not available, which is uncomfortable for a couple. This is the 2nd time it happened leaving me with the question mark if there is any room with a king/queen/double bed or if it is only twin beds. In addition the AC was leaking. The property is nice and private. Rooms are clean and kitchenette is equipped with the necessary appliances. Location is nice, surrounded by tropical trees giving you that peace of mind that you were looking for. We did not manage to reach to the pool and beach however, based on previous experience and visits to the beach and restaurant I am sure you will enjoy it.